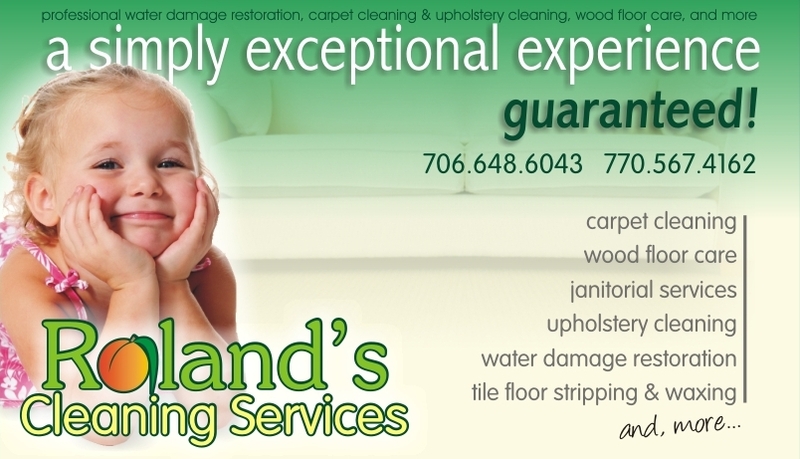 You can rely on Roland's Cleaning Services for the best carpet cleaning in town, the first time and every time! We're Roland and Zenova, the owners of Roland's Cleaning Services, Inc. and we'd like to thank you for stopping by. Established in 1980, we're a family business providing professional carpet cleaning, upholstery cleaning, wood floor care, water damage restoration and janitorial services for families and businesses in Thomaston, Georgia and the surrounding areas including Lamar, Meriwether, Pike, Spalding, Talbot and Upson counties. Whatever your need, whether is an early morning water emergency, an accidental spill, pet problems or simple everyday wear-and-tear, no job is too big or too small, we handle it all. Our goal is your delight, it's that simple. And, how do we hope to live up to this promise? Well, that's simple, too. By overwhelming you with products and service of uncompromising quality and standing behind everything we do with an equally uncompromising guarantee we hope Roland Cleaning Services becomes the preferred choice for your carpet and upholstery care needs. A benefit you'll be sure to appreciate is not meeting a stranger at your door every time you call. As the owners and operators, he's the fellow who comes to your door to personally care for your furnishings. We bet you'll appreciate this, too. First, we make appointment times you can live with. None of this "between 9 and 3" stuff to waste your valuable time. We'll even arrive on-time and call if we're running behind! 706-648-6043 or 770-567-4162 for your FREE, No Obligation estimate today? In the meantime, please browse through our site. Feel free to call us anytime if you have any questions or concerns about our carpet cleaning, upholstery cleaning, wood floor care, water damage restoration or janitorial services. We’ll explain everything and answer your questions in plain and simple terms. There's never any obligation, never any pressure, and never any games. We promise! © 2010 Roland's Cleaning Services and its licensors. All rights reserved. This site best viewed with Microsoft Internet Explorer. Web Design by Miller Creative!